View of “Fiona Tan: Inventory,” 2015. Fiona Tan slows down time. Her film Inventory, 2015, tracks through London’s Sir John Soane’s Museum, scanning its eccentric nineteenth-century collection. Tan turns her eye to the artworks and fragments of the expansive and overflowing museum: crumbling portraits, disembodied limbs, and its strange architectural minutiae. Objects mutate under her languid gaze. Her camera is methodical and sedate. 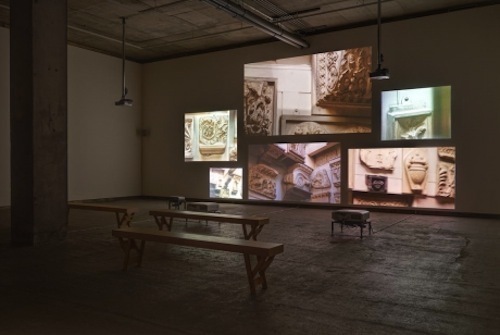 Composed from six projections—all taken with different cameras (both digital and analog)—the video peers over the collection as if it were evidence from a wreckage. The faces, objects, and fragments appear ruined, as if dissolved by the vicissitudes of time. “There is no antidote to the opium of time,” the film states in the prologue. Time is like a drug—it both seduces and ruins its subject. No voice-over is present in Inventory, which effectively—and refreshingly—allows its spectator to look without prescribing how to look. We are shown multiple perspectives of the same object, and yet no angle is sufficient: Each camera appears to look at the world as though it were appearing for the first time, slackening our gaze to the pace of a single breath. Tan moves from the very close to the very far, without sudden shifts in scale. Inventory ends with a meticulous look over a severed limb (a leg), held up precariously by metal wires. An object like this limb does not go to the museum to die, but to be imagined anew.